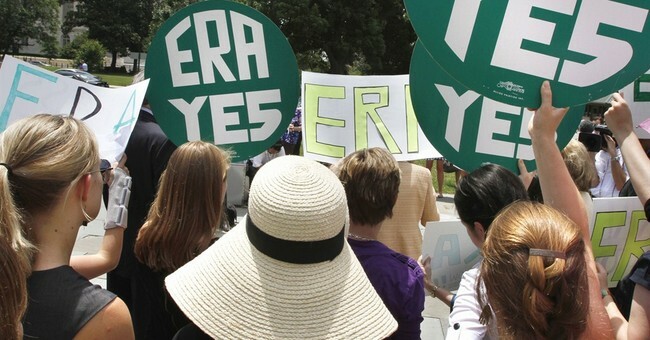 The Equal Rights Amendment (ERA) has been passed between state legislatures and Congressional filing cabinets for almost 100 years, as good intentions never materialized into good public policy. Introduced by Alice Paul and her National Women’s Party in 1921, the ERA’s stated goal was to ensure the equal rights of men and women. The timing of the ERA proposal in 1921 makes a lot of sense; it was right on the coattails of the 19th Amendment, which granted women the right to vote. Those early feminists wanted to make sure their newly found rights were permanent. But women in present-day America have equal rights (contrary to what our more angsty sisters scream at rallies). If a man and a woman are doing the exact same job, we get paid the same. We run (and get elected) for political office. We even go to college at a higher rate than men now. Miscellaneous politicians looking for a boost in the polls have dragged out the ERA a few times over the century. But why the fuss about it now? They got close to ratifying the ERA in the 70s, but let’s recall what also happened in the 70s: the passage of Roe v. Wade, the Supreme Court case (in conjunction with Doe v. Bolton) that legalized abortion in America for any reason and up until the moment of birth. The “Equal Rights Amendment” sounds real pretty and bipartisan... but the timing is way too suspect to ignore. The abortion lobby is terrified of the current conservative majority on the Supreme Court. As it is, the continued existence of Roe hangs in the balance. Make no mistake: the ERA is not about equal rights; it’s about abortion. Betty Friedan, one of the founders of today’s ERA movement, said so herself. And it is the height of sneakiness and manipulation for pro-abortion lobbyists and politicians to hide their true reason for pushing this amendment at this moment. One of the reasons it hasn’t been passed all these years is because people in favor of women’s rights can’t unify – and rightfully so. Today’s toxic feminist movement has done a great job of making it clear that pro-life people are not allowed in their club. And seeing as the majority of women do not agree with abortion for any reason up until birth (and apparently after birth, as we’ve just witnessed with the Born Alive legislation’s failure), that isn’t exactly a winning strategy. It was pro-life women who kept the 1970s ERA attempt at bay, once they realized it was an attempt to put abortion in the Constitution. The ERA’s passage requires a 38-state majority and currently the count is one state short. In May of last year, Illinois became the 37th state to ratify it – leaving abortion activists looking for a 38th to approve the radical measure. Virginia recently gave it a try, unsurprising given their Governor’s infanticidal leanings. Students for Life and other pro-life groups rallied in opposition, reminding others that this amendment is all about enshrining abortion, not equal rights. The ERA is as radical as New York’s Reproductive Health Act. It would effectively silence the states and abolish hundreds of common-sense abortion limitations in states that saw fit to legally pass them. Given that the majority of Americans do not agree with the Democratic Party platform of “taxpayer-funded abortion, for any reason, and up until the moment of birth (and maybe after),” the passage of the ERA would silence millions of people (double-meaning intended). Not to mention, the ERA would also wipe out hundreds of laws that were passed to benefit women, such as social security benefits for widows. The obsession with adding abortion to the Constitution has taken over feminism to the point where they don’t care about the collateral damage. Modern feminism doesn’t care what happens to women; it cares that women can have abortions. So if you’re someone who doesn’t want to see 6-month-old babies killed in the womb and tossed in a landfill, we’ve now arrived at a point where you’ll be called “anti-woman” for your trouble. Pro-life advocates better get ready for the fight of their lives. Proponents of the ERA have a lot of pop culture tools in their arsenal, like blind loyalty to today’s brand of feminism and obsession with gender issues. Even transgender participation in sports is being used to club people into supporting the ERA. Pro-life women support equal rights for women: equal access in education, equal access to economic opportunities, and protections from sexual harassment. But we don't want to be forced to subsidize abortions. Are there issues we still need to address? Of course. But let's address those issues without ending innocent human life.